I went to the Omaha Royals vs. Oklahoma Redhawks game on Friday night. The Omaha Royals won 4-2 in a well-pitched game by both teams. 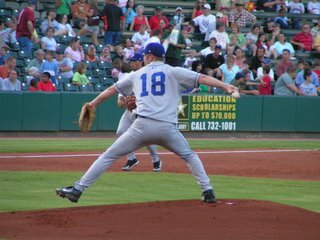 Mike Wood made a rehab start for the Wranglers and left the game in the 3rd inning. Wood was pretty hittable, giving up a lot of line drives. The defense also made a few mistakes behind him, contributing to his early departure. Pat Mahomes came in and pitched 5 1/3 shutout innings. Mahomes has a strange delivery, but kept hitters off-balance with good offspeed stuff. Leo Nunez closed out the game with a solid inning and picked up his 4th save. On the offensive end, Shane Costa hit his 10th HR of the season, a blast to right field that bounced off the back of the bullpen. 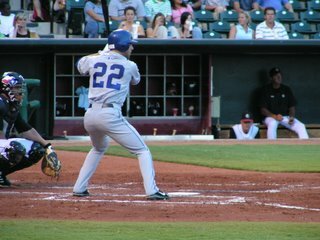 Paul Phillips had two hits, including a double. Kerry Robinson drove in the game-winning run. Justin Huber: Huber didn't have a great night at the plate, but he hit the ball hard twice. Huber looked pretty comfortable in left field. He looked faster than I expected, getting to balls in the gap quickly. He did a pretty good job reading flyballs and made a tough catch against the wall in LF. I think Huber will end up as a left fielder in the majors and it was a good decision to move him there. I don't think it's unreasonable to think he could be the Royals' starting left fielder next year. Shane Costa: Costa looked pretty pissed off, most likely because he wasn't promoted to the big league club after Sanders' injury. Costa hit a very deep homerun to RF. Costa has shown improved power this season. Costa is naturally very strong like Teahen, so I think he could have a breakout season like Teahen. Mike Aviles: Aviles looked surprisingly big. He showed good speed on the basepaths as well and drew a couple of walks. He's probably a AAAA player, but could be a useful utility guy. Paul Phillips: Phillips had a nice night at the plate and has shown decent power this season (9 HRs). I wasn't impressed with his defense, particularly his throws. He had two wild throws during the game, on to second and the other to third. As much as Royals' fans lament Buck, Phillips isn't the answer either. Leo Nunez: Nunez pitched a very good inning for the Royals. He allowed just one hit, a bloop single. I didn't see him throw much other than his fastball though, but he commanded it well. Sorry for not posting much of late, been very busy. The Royals put together a nice win tonight. Mark Teahen has had an outstanding season, exceeding all expectations. Tonight, he went 4 for 4 with a HR (16), a pair of doubles, and 2 RBIs. Teahen does everything well. He's hitting for power, getting on-base, stealing bases, and playing solid defense. He's a complete player, pretty similar to what most people think Alex Gordon will become, with maybe slightly less offensive ability. Nonetheless, his improved power and plate discipline have made him into an excellent hitter. It's still uncertain whether Teahen or Gordon will change positions. But, the Royals have a great problem to have with two very good third basemen. Odalis Perez pitched well for the Royals, allowing just 2 runs in 7 innings, striking out 4 and walking just 1. He's pitched better for the Royals, with a 4.66 ERA after 5 starts for the Royals. The trade for Perez and two young minor leaguers for Dessens is looking like a very good one for the Royals. In other news, Chris Nicoll was promoted to High Desert. Nicoll has very good numbers at Burlington, with a 2.82 ERA and 140 strikeouts to 40 walks. The Royals have been pretty conservative with their pitchers this season. Brent Fisher is still in the Arizona Rookie League, which he's dominating for the second season in a row. I'm not sure what's wrong with a 2.28 ERA, 80 strikeouts to 16 walks, and just 2 HRs allowed in 59 innings. Looking at the stats, it'd seem there's nothing left for him to prove. However, they must have something in mind for him to work on. 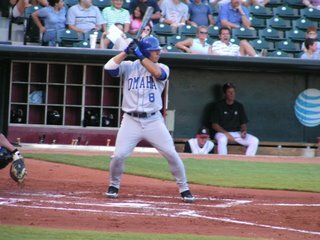 I will be at the Omaha Royals game on Friday, so I will provide some insight on the Omaha team this weekend as well as pictures from the game. If there's anyone you want me to focus on, let me know. The team that had played roughly average baseball for June and July has vanished. The Royals' team we've grown accustomed to has reappeared as we all knew it would. The starting pitching has been awful, particularly over the past few games. Luke Hudson's 11-run, 1/3 inning start may have been one of the worst all-time. Hudson didn't have good command, but the Indians weren't hitting him hard (except for one homerun). He just couldn't find the strikezone. Most of the balls hit against him were grounders that found holes or and the worst's deepest trench, Angel Berroa. So, perhaps there is still some hope for him. Redman's start last night wasn't much better, surrendering 8 runs in 3 2/3 innings. The Royals finally broke their skid of horrible baseball. The Royals won 4-2 on Tuesday thanks to an unexpected quality start from Runvelys Hernandez, who has been completely useless this season. Mark Teahen continues to be the Royals' best bet, hitting his 14th HR to centerfield. Teahen's development of good power has been the nicest surpise of the season. Emil Brown has also continued to hit well. Brown has hit 4 HRs and is sporting a .326/.385/.674 line so far in August. Brown has a .800 OPS overall on the season, a slight decrease from last season. Nonetheless, Brown remains one of the Royals' most productive bats. I'd much rather have Brown back for next season than Reggie Sanders, but the $5 million on Sander's contract will make him tough to move. The Royals have no continuity whatsoever in the rotation. That's a problem that must be addressed in the offseason. The Royals need to acquire at least two reliable veteran starters, especially if Odalis Perez doesn't revert to his 2005 form. Hernandez has been terrible this season, so he will likely be non-tendered. Elarton might be back by midseason, but he isn't worth saving a spot for. Jimmy Gobble appears to be best suited for a setup role, so he probably won't be a starter. Hudson and De La Rosa have great stuff, but they are very inconsistent. The Royals will have Greinke back next year and Lumsden will probably join the rotation at some point. But, most of the spots are wide open. The Royals' starting pitching has been dreadful for the past decade, finishing at the bottom in most pitching statistics. This season is no exception, with the Royals' starters having the highest ERA, fewest strikeouts, tons of walks, and the fewest innings pitched. So, is there hope for the Royals' rotation? The Royals' starting pitching depth has shown significant improvement over the past few months, particularly at lower levels. The Royals also have a few talented starters who could be mainstays in the rotation by 2008. Predicting the rotation in 2008 is a pretty tough task. The Royals' current rotation doesn't have any starters who will likely be long-term starters for the Royals. Perez, Elarton, and Redman's contracts will have expired by 2008 and Hernandez will be released or non-tendered this offseason. Jimmy Gobble is best suited for the bullpen, although he may become a #5 starter if given enough opportunity. Luke Hudson might be the best bet to become a good starter for the Royals, as he has pretty good stuff and appears to have figured out his command problems. Hochevar, Greinke, and Lumsden have frontline to mid-rotation starter talent, but they probably won't reach that potential until 2008 or 2009 (if they ever do). Realistically, I think one of those starters will reach their potential as a frontline starter, one will be an average starter, and one will be a bust or get injured. Given the Royals' track record of developing pitching, that is probably an optimistic outlook. Nonetheless, the Royals need to add some more top starting prospects to improve their chances of building an above-average rotation. Starting Pitching Prospects: Hochevar, Greinke, and Lumsden give the Royals the best shot at a quality rotation by 2008. By that time, the Royals should have another group of starters approaching the majors as well. The Royals' currently have a very good rotation at Burlington featuring this next wave of pitching talent. The Burlington rotation features 5 good young starters, Cordier, Nicoll, Kniginyzky, Rosa, and Cortes. Cordier has the best stuff and has been lights out for Burlington. He could move very quickly through the Royals' farm system and has frontline starter potential. Nicoll is probably the second-best bet to become a major-league starter. He also should move quickly as a polished college pitcher with excellent control. Kniginyzky is also a college pitcher who was converted to a starter this season and has pretty good stuff. Rosa has good stuff and is still pretty young. His command still needs some work though. Cortes is the youngest of the group at age 19 and is holding his own in low A ball. Overall, the Burlington rotation gives the Royals 5 good arms who could all emerge as mid-rotation starters by the end of the decade. High Desert also has a few starters worth noting. Blake Johnson, acquired in the Dessens/Perez deal, has excellent command and good strikeout numbers. Luis Cota has struggled at High Desert, but he still has a live arm with lots of potential. Cota has pitched better lately, so maybe he's starting to master High Desert. Overall, the Royals have much improved pitching depth, particularly in the low minors. While the improvements probably won't help the big-league team for a few years, they should make an impact once the Royals' offensive core has fully developed at the major leagues. Organizational Needs: The Royals need some veteran pitching to improve the rotation until Greinke, Lumsden, and Hochevar are ready. The Royals also need more pitching prospects near the major leagues so they can improve the rotation in the next couple of years. Offseason Moves: Moore should continue to focus on getting more young pitching into the Royals' organization, as he did throughout July. The Royals need a couple of veteran starters to anchor the rotation in addition to Perez. The free agent market has a lot more starters around the age of 28-30 who are decent #3 or 4 starters. So, the Royals should be able to get one of those starters fairly easily. The Royals have some problems up the middle. The Royals don't have many options at catcher and John Buck is still questionable as an everyday catcher. The Royals have a few options at second base, although none are particularly young. The Royals have a shortstop who is the worst everyday player in major league baseball and two young minor leaguers who are still a couple years away from being better. The Royals are in good shape in centerfield, with two quality options in Gathright and DeJesus. The exception to the Royals' weakness up the middle is centerfield, where the Royals have an established centerfielder in David DeJesus who has been moved to a corner spot for Joey Gathright. If Gathright doesn't develop into a base-stealing, on-base machine to counter his poor bat, then the Royals still have DeJesus to play centerfield. The Royals also have a solid, all-around centerfielder in Mitch Maier, who is having a good season at AA. So, the Royals shouldn't have any problems fielding a quality centerfielder. After all, when was the last time the Royals didn't have a very good centerfielder? The pre-Damon era? The shortstop position is the exact opposite of the centerfield position. The Royals have had a lot of trouble finding a quality shortstop over the past decade. Angel Berroa is a horrible baseball player who will make $8 million over the next two seasons. The Royals' two best options in the minors are Andres Blanco and Angel Sanchez. Blanco has a worse bat than Berroa and he may be a better defender, but he possesses the same maddening inconsistency on defense that Berroa has. Sanchez may eventually be the best hitter of the three, but his defense still needs a lot of work. Blanco and Sanchez will not be quality options until the end of Berroa's contract, so it looks like we're stuck with Berroa for now. Mark Grudzielanek has done a nice job at second base, particularly defensively. He might be an option for next year, but the future depends on Esteban German or Jeff Keppinger. In limited opportunities, German has shown excellent on-base skills and great speed on the basepaths. To become an everyday second basemen, German will have to improve his defense. Hopefully Buddy Bell's tenure as manager ends quickly and German gets a chance to play everyday at second next year. I don't know much about Jeff Keppinger, but Moore says he will compete for the second base job as well. The catching position remains a problem in the organization as it has been for about 10 years. John Buck hasn’t shown too many signs of improving offensively behind the plate. He’s shown some power, enough to hit 10-15 HRs a year and probably bring his OPS into the .700-.750 range. He is pretty average throwing out runners and probably above-average behind the plate. The Royals don’t have any options to replace him. The Royals’ closest prospects Paul Phillips and Matt Tupman project as backups at best. Organizational Needs Up the Middle: The Royals need to address the shortstop problem and find a long-term replacement for Berroa in the next year or two. John Buck is an acceptable option behind the plate if he improves offensively. Catcher’s bats can be slow to develop, so it’s best to be patient with Buck. Unlike Berroa, he does contribute defensively at an important position. Offseason Moves: The Royals will have to decide whether or not they are comfortable with giving German and Keppinger the everyday second base job. If not, Grudzielanek would be a likely candidate to return. The Royals should also try to trade for a shortstop prospect close to the majors, perhaps packaging Lubanski or Maier in the deal. The next two posts will look at the Royals' organizational depth chart and look at what the team will look like by 2008-2009. This post will focus on the Royals' position players. The Royals' greatest organizational strength is at the corner positions, where they have a strong group of power bats approaching the majors. Dayton Moore's plans include power at the corners and speed up the middle. The Royals should have plenty of power bats at the corner positions by 2008-2009. The Royals have some speed up the middle, but those players might not be more than part-time players. The Royals have some important questions to answer at the corner spots. The Royals depth chart has a lot of overlap at the corners, so it's very difficult to project what position the organization's corner infielders and outfielders will eventually play. The Royals have two excellent third basemen, but one will have to be moved to first base or the outfield. Justin Huber and Billy Butler are currently playing outfield in the minors, but both are defensive liabilities there and may have to move to first base/DH. Mitch Maier and Chris Lubanski project as much better defenders, but have much weaker bats. The Royals also already have a solid corner outfielder in David DeJesus, but he could be moved back to centerfield. Butler, Shealy, and Huber project as above-average to All-Star corner bats and two of them will likely reach those projections. Lubanski and Maier will provide some insurance in case more than one of those players doesn't pan out or they may become trade bait. Organizational Needs at the Corners: The Royals are in a very good position at the corner spots by 2008. The Royals might need a stopgap outfielder or 1B/DH for next year. Sanders and Sweeney will likely be those stopgap players because of their expensive contracts. Offseason Moves: The Royals will try to move Sanders and Sweeney and perhaps resign Mientkiewicz or another stopgap first basemen or outfielder. Lubanski or Maier might be added to sweeten a deal. Johnson has pretty average stuff with some potential for improvement. His best asset is his command, averaging just 1.5 walks per 9 innings. Combined with a respectable strikeout rate and pretty low HR allowed rate, his defense-independent stats are very good. Right now, he projects as a back rotation guy, but that could change if his velocity improves. Braun has had a very good recovery from his injury last season. He has a great fastball that can reach 98 mph and a solid slider to complement it. Braun is pretty old for a prospect, but he was injured last season and was drafted as a college senior. So, he's moved fairly quickly. He projects as a solid setup man if he can command his stuff well. The Canadian righty has made a very good transition from relieving to starting. His fastball sits in the low 90s and can reach 94 mph. He also has a good curveball and a developing changeup. Rosa has had a very good comeback season, performing very well at Burlington. His fastball was reaching 94 mph and his velocity is reportedly back. He has a good curve and change, so he has the repertoire for starting. Many Royals fans hope that Sanchez will eventually unseat Berroa. However, that probably won't be until Berroa's contract ends. Sanchez's defense still needs a lot of work and he hasn't shown much power yet. Nonetheless, his plate discipline is much better than Berroa's, so there is some hope for him. Pimentel struggled at the Dodger's high A club. He's lack of command and hittability has led to a WHIP of 1.76. Pimentel has a live arm with a mid-90s fastball. The rest of his repertoire is pretty unpolished still, but he has the potential for two or three plus pitches. He projects as a solid reliever unless his secondary stuff improves. Christensen has had a great comeback from his injury two seasons ago. He has a very good K/BB ratio. He's given up a lot of hits and home runs, but that may be High Desert related. He has an outstanding curveball, so at the very least he should be a good lefty setup man. Dickerson has made a successful transition to advanced Rookie Ball and has started to show some power of late. He's shown good contact skills during his first two professional seasons and he's best known for his defensive abilities. His offensive struggles at Burlington sent him back to the pioneer league, but it hasn't helped him much. McConnell still has some projectable skills, even though his development hasn't been as fast as expected. The Royals' fifth-round pick has had a good debut in the Pioneer League. He's shown good command and the ability to rack up strikeouts, something he did in college as well as Justin Verlander, the Tigers' new ace. Dayton Moore's trades have significantly strengthened the Royals' farm system and added a quality group of arms to the low minors. There's finally some pitching depth the Royals' farm system which lacked pitching depth for a decade now. The Royals have a nice core of offensive players, so the Royals have the makings of a complete team in the near future. The Royals still have to improve their ability to develop pitching talent, as that remains a major problem in the organization that has yet to be addressed. Adding more pitching prospects to the farm system is one way to try and overcome the inefficiencies of the Royals' pitching development schemes. Moore says pitchers will spend more time at AAA and won't be rushed to the majors, so that should help the Royals develop young pitching. Moore is taking the organization in the right direction and the improvements to the farm system throughout his short tenure are pretty impressive. 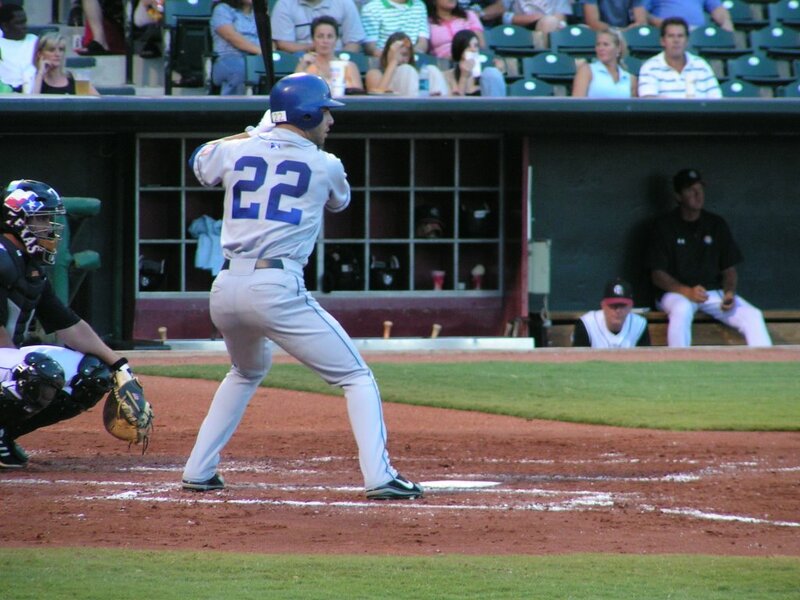 The addition of Hochevar spared the 2006 draft from being a disaster and added another impact player to the farm system. 1. Alex Gordon 22/3B: Gordon has become one of the top two or three prospects in the minors. His July numbers have been absolutely ridiculous, boosting his OPS to .963 and giving him 19 HRs overall. Gordon was recently on Baseball America's Prospect Hot Sheet and they said he was putting himself in consideration to be their No. 1 minor-league prospect next year. Gordon has no weakness and should be an All-Star third basemen in a couple of years. His recent surge will likely earn him a promotion and he could be on the Opening Day roster next year. He's just that good. 2. Billy Butler 20/OF: Butler hasn't shown as much power this year as he did in his previous two seasons. However, he has still hit 41 extra base hits, including 12 HRs. He's still very young, so he will get stronger physically and could eventually develop into one of the best power hitters in the game. He'll likely spend the rest of the year at AA and then most of next year at AAA. His defense has shown noticeable improvement this season, so given some extra development time it may become passable in the outfield. 3. Luke Hochevar 22/RHP: Hochevar has sat out most of two minor league seasons holding out. Hochevar has 4 above-average pitches and a fastball that sits in the mid-90s and can reach 98 mph. He has the stuff to be a future No. 1 starter. He has been doing some conditioning on the side, so he should be in shape to head to Burlington fairly quickly. If all goes well, he should pitch in the Arizona Fall League and have a chance to reach the majors for good by 2008. Shealy has displayed very good power throughout his minor league career, hitting 25+ HRs in the past two seasons and continuing that pace this season. Shealy has been productive in his major league debut, hitting .320/.370/.470 in his first 100 ABs. Shealy is already 27, so he's pretty old for a prospect. Nonetheless, he should supply the power needed for a first basemen. His defense, however, is pretty shaky at first. Most Royals fans seem to have soured on Huber, but he's consistently put up very good numbers. His frequent injuries have set him back and he hasn't made enough progress defensively at first base. If he can play a serviceable left field, that might be his best ticket to the majors. He probably won't hit more than 20 HRs a year in the majors, but his on-base skills will make him a solid player at a corner position. Lumsden possesses two very good pitches, a mid-90s fastball and a slider. His command has shown improvements this season. 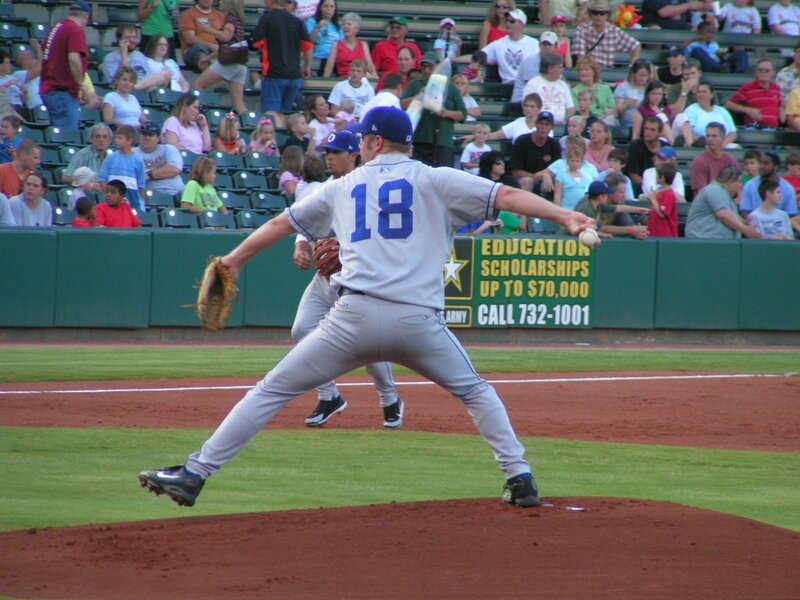 Lumsden projects as a mid-rotation starter and could be in the Royals' rotation by 2007. Lubanski has fallen from the #4 prospect to #7 not because his stock has fallen, but because the farm system has become much stronger. Lubanski has done very well for a 21 year old and has recovered nicely from a slow start. Lubanski has drawn 52 walks, giving him a good .358 on-base percentage. Lubanski still has pretty good speed, even though he isn't much of a base stealer. He doesn't have a very good arm, so he'll be in left or center field. Erik Cordier's stock has risen incredibly throughout this season. Last season, he had some lingering leg injuries that kept him from pitching. Fortunately, he hasn't had any injuries to his great young arm. Cordier's fastball reaches 98 mph and his changeup and curve are excellent complementary pitches, giving him 3 potential plus pitches at the big-league level. He has the potential to be a frontline starter down the road and could move quickly through the Royals' farm system. Buckner finally mastered High Desert this season, putting together a good 3.90 ERA in 90 innings. However, he has struggled at Wichita. His strikeout numbers are very good, averaging almost one strikeout per inning. His command needs a lot of work, as he's walking about 5 batters per 9 innings. Buckner has an outstanding curveball and a good fastball. He projects as a No. 4 or 5 starter. Bianchi has been extremely impressive when he's been healthy. He is dominating the Arizona Rookie League again, with a ridiculous 1.204 OPS. Unfortunately, his back injury continues to linger and he's been out for several weeks now and may need back surgery. Bianchi has the talent to be a 20/20 player, but he's going to have to overcome his injury problems. Nicoll is putting together a solid season at Burlington. His command has been very good, averaging 2.5 walks per 9 innings. He's also averaging one strikeout per inning. Nicoll has a solid average repertoire and might add some velocity before reaching the majors. Right now, his projection is similar to Buckner's as a back of the rotation guy, the Royals' house speciality. Mitch Maier remains one of the best bets in the farm system to become a major-league players. He's an excellent defensive outfielder and one of the few outfielders in the organization with enough arm strength and foot speed to play rightfield. He's shown improved power this season, but will probably need to show more to become an everyday player. His defensive abilities and solid bat should make him at least a very good fourth outfielder. Cortes is having a pretty good season, particularly for a 19-year-old. He has a good sinker and slider combo, with a fastball that can reach the mid-90s. His K/BB ratio above 2 and low HR totals are promising. Cortes still has some projection remaining, but could eventually emerge as a mid-rotation starter. Fisher has dominated the Arizona Rookie League for a second season in a row. Why he hasn't earned a promotion is a mystery. He has an outstanding K/BB of 5.4 and hasn't allowed many hits or HRs. He's a protypical lefty with a sinking fastball and a curve and neither pitch projects to be overwhelming. Cota has struggled at High Desert after a good season at Burlington last year. He's pitched better than his 7.10 ERA indicates. His K/BB ratio is pretty solid, although his command still needs some work. He needs to work on his secondary stuff, but his great arm gives him at least mid-rotation potential. The Royals announced this morning that they have signed their top pick Luke Hochevar. After hearing nothing about the negotiations for the couple of weeks, this comes as a very pleasant surprise. It appeared as though Hochevar wasn't going to sign anytime soon, if at all. But, the Royals now have Hochevar signed to a 4-year major league contract. That means Hochevar will have to be on the 40-man roster. He will be optioned to the minors, most likely to Burlington and then move up to High Desert. Considering he pitched well against a High A/AA level caliber independent league, he should move pretty quickly. If all goes well, perhaps he'll get a chance to pitch in the Arizona Fall League. After sitting out most of two seasons, he'll need all the innings he can get. Even though I don't really like giving an amateur player a major-league contract, I'm pretty pleased with the deal. The Royals certainly took a gamble by selecting a Boras client who had already held out for one season. But, the Royals were able to sign one of the top two pitching talents available and a potential ace. Hochevar strengthens the farm system considerably, which is lightyears ahead of where it was a few months ago. The mechanics of Hochevar's contract don't have any implications on service time as far as I'm aware. As long as he is in the minors, he won't accrue service time, which determines when he becomes a free agent. I believe the 4-year contract simply means he gets paid whatever they agreed to over the next 4 years and he is still under the Royals control until he has 6 years of major league service time. He has three option years, so Hochevar has until the end of 2008 to reach the majors. This is great news for Royals fans, as the Royals added a potentially great arm to their farm system who should be ready on the same timetable as the organization's premier offensive talent. Also, this shows that the Royals aren't afraid to deal with Scott Boras. Finally, the past two drafts have shown that the Royals will go after the best player available in the draft and aren't afraid to spend the $4-5 million required to sign the best player. It appears the Royals are finally headed in the right direction. As promised, I will have the updated prospect list shortly with our newest addition, Luke Hochevar. Royals' GM Dayton Moore finished off the July trading frenzy with two more deals on Monday. The Royals traded Jeremy Affeldt and Denny Bautista to Colorado for first basemen Ryan Shealy and pitcher Scott Dohmann. In a smaller deal, the Royals traded Matt Stairs to the Rangers for RHP Jose Diaz. 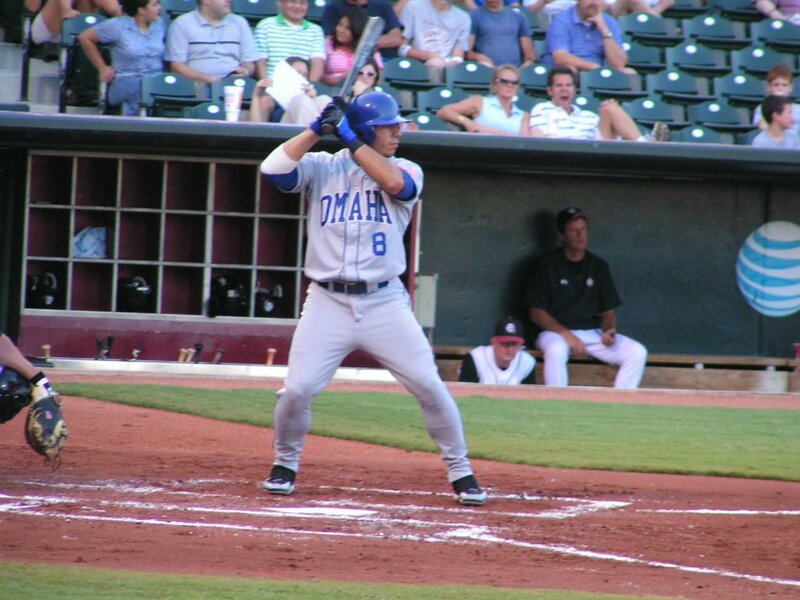 First basemen Ryan Shealy had been coveted by Dayton Moore and many Royals fans. Shealy has put up good numbers with 15 HRs in 222 ABs and a .284/.351/.568 line overall. Shealy is turning 27 this month, so he's no youngster. 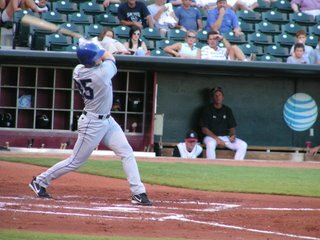 In 2005, Shealy had 26 homers hit .328 at AAA. In 2004, he had 29 homers and hit .318 at AA. He was on pace for another 25-30 HR season, so he's shown steady power throughout his career. He's been blocked by Todd Helton in Colorado, so he hasn't seen much big league action. He's made the most of his limited opportunities, hitting .320/.398/.470 in his first 100 major league at-bats. So, hopefully that's a sign of things to come. His right-handed bat adds to the surplus of righties at the 1B and DH position with Sweeney, Huber, and Butler projected to hold those spots down next year and beyond. Shealy will join the big league club and get a significant number of at-bats for the rest of the season. With Huber, Shealy, and Butler, the Royals should have enough good bats to fill out the 1B and DH positions. Scott Dohmann isn't young either. The 28-year-old righty has a 6.20 ERA in 24 2/3 innings with 15 walks and 22 strikeouts. Dohmann is averaging over 1 strikeout per inning throughout his career, but the walks and home runs have hurt him. He throws 92-94 mph and has a good slider, so he's a good candidate for a setup role if he can improve his command. I hope Moore saw something in Dohmann, because you usually don't trade for 28-year-old relievers who haven't figured out how to throw strikes. Jose Diaz will also add some bullpen depth. Diaz has pitched very well of late and has struck out 75 in the last 62 2/3 innings. The Shealy deal looks alright to me. The Royals have a pretty good offensive core already developing and this solidifies the 1B/DH position even further. Dohmann doesn't have much upside, but might be a useful middle reliever. He's basically a throw-in. Denny Bautista has a lot of upside, but for every 100 Bautistas, 15 will become good setup men and 5 will become frontline starters. Like Affeldt, I'm convinced Bautista wouldn't ever become anything in a Royals' uniform. Both needed a change of scene badly. In the next few days, I'll redo the Royals' top prospect list. The Royals' pitching depth has improved remarkably over the season with the emergence of the Burlington Bees' stout rotation and Moore's moves in July.